Join UIW volunteers at the 52nd Annual KLRN Blazing Gavels Auction! 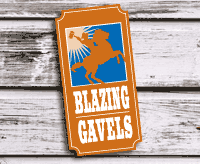 Blazing Gavels is the largest and most ambitious live, televised auction staged annually in San Antonio. During the event, hundreds of businesses from across the country donate goods and services to be auctioned off in support of public television. We are looking for UIW alums, staff, parents or current students to fill our UIW volunteer time slot from 5:30 - 9 p.m on Thursday, June 14th.